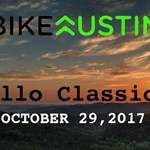 The Armadillo Classic is an amazing ride for cycling enthusiasts of all ages, ride preferences and abilities that wanders through the Texas Hill Country and The Balcones Canyon-lands National Wildlife Refuge. Routes are not final and are subject to change. Bike Austin is a membership-based organization. For our Bike Austin members we have established a discounted rate registration fee for our supporters. All registration fees include a fully supported ride route, parking, lunch, beer, ride t-shirt, and a whole lot of fun while supporting your local bicycle advocacy and education organiztion. If you need more support, please email events@bikeaustin.org.